4-6-2007 - Updated description, added photos. If you decide to make a stereo upgrade according to the following schematics and instructions you do it at your own risk! 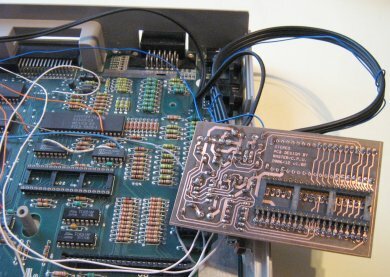 The authors' intention was to create preferably the least invasive solution without irreversible changes to the Atari computer and damaging the Pokey chips by bending their pins. (Some brutal howtos even suggest cutting the unused pins off - please don't ever do that!) If you decide to somehow modify your Atari please do it carefully and avoid any unnecessary alternation. The Pokey chip is to be carefully removed from the motherboard with a micro soldering iron and replaced with a precision socket which will then hold the stereo upgrade PCB bearing 2 socketed Pokeys and additional parts along with an operational amplifier. This design supports mono/stereo switching, BELL signal mixing (key click, buzz signal) to both stereo channels and mixing the right channel to the 5-pin DIN monitor out and also the modulator's audio signal. Note: Don't forget to buy an additional DIL40 precision socket that will replace the Pokey chip on the motherboard, in which one side of the double sided DIL40 pins on the stereo PCB will be inserted. The solder side of the PCB holds the double sided DIL40 pins only. It is necessary to file down their plastic sides to bare the pins partially to be able to solder them in place. All other parts are located on the component side. Solder the double sided pins last, not to prevent yourself from soldering the POKEY_LEFT precision socket. Insert the Pokeys only after finishing all the soldering. (Click to view full size image of the PCB). A4 ... connected to Atari's address bus - A4 signal.. 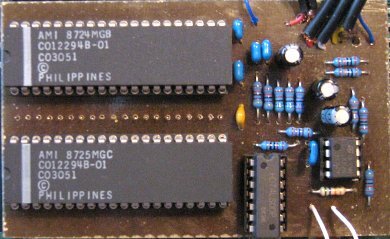 It can be found for example on the 6502 CPU's pin 13, ANTIC pin 28, GTIA pin 38 and elsewhere. SOUND_R ... connected to U1B (LM358) pin 6. This chip is located near the TV modulator. BELL ... connected to GTIA pin 15 (S3) (BELL signal). OUT_G ... ground for the audio out cinch connectors. OUT_L ... left audio out for the cinch connector. OUT_R ...right audio out for the cinch connector. It is wise to use shielded cables for audio signal routing. 4,5,6 are audio signals so they should be connected by a shielded cable.Signal #3 is ground so it can be used for shielding the audio signals 4,5,6 and simultaneously for pin 3 of the switch which connects ground to pin 2 when set to off. Pin 1 is unused. Photo of the PCB - solder side. 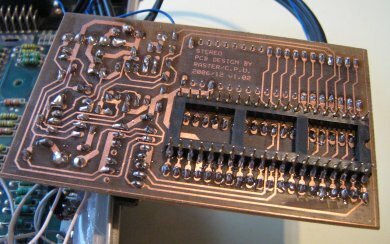 Photo of the populated PCB. Parts: DIL40 precision socket on the left, double sided DIL40 pins on the right. 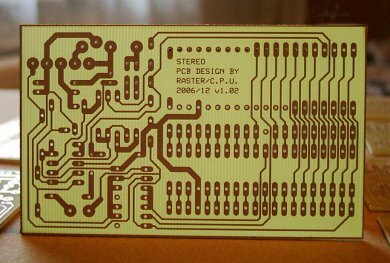 The lower - solder side of the PCB. 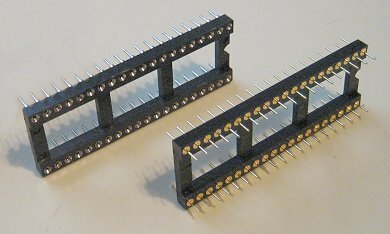 It is necessary to file off the plastic sides of the double sided pins for soldering. Audio out cinch connectors nicely fit above the TV modulator. 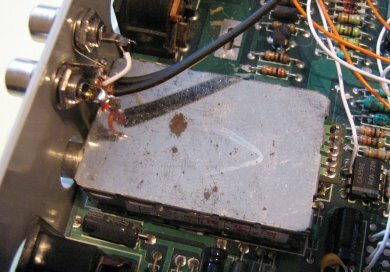 See the U1B (LM358) chip right of the modulator. The SOUND_R signal from the stereo PCB is connected to its pin #6 with the white wire. Atari with the precision socket soldered in. The stereo upgrade PCB snaps in and can be replaced with the original Pokey chip any time (after desoldering the wires). Overall view of the PCB in place. 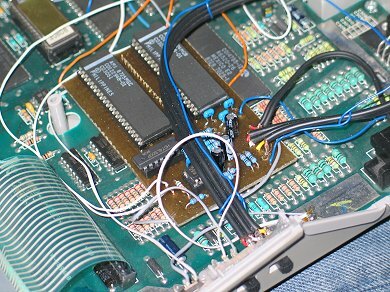 The three black shielded wires, along with the blue one, head to the side of the Atari where the mono/stereo switch is mounted. The black shielded double wire leads to the audio out cinch connectors. The other blue wire carries the BELL signal from GTIA. The two white wires on the opposite side carry the A4 and SOUND_R signals.